“Send random messages to people. They will surely reply. 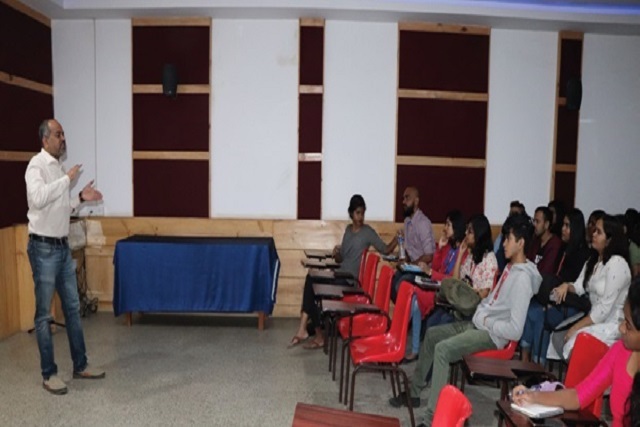 Then make the best use of it,” said Amith Prabhu, a seasoned Public Relations (PR) professional on Wednesday, January 9, while addressing the postgraduate students of the Department of Mass Communication at St Joseph’s College (Aurtonomous). Prabhu engaged the students with his knowledge and experience that kept them glued to the two hour long workshop. He started the session by asking the students about the interest they held for PR as a career. He went on to explain how PR had become a profession due to a crisis precipitated by another crisis, elaborating on the history of the profession. To help the students understand what the field demands, he condensed the PR world into four Cs. The first C is Content creation, followed by Counselling the audience, Connecting with people and most importantly Crisis management. He elaborated on all the elements of the four Cs throughout his talk. The session was predominantly interactive, with the students along with the teachers engaging in discussions. Prabhu urged the students to show active participation on social media like Twitter and LinkedIn, and to also take up the habit of writing blogs. According to him, these are the best tools for connecting with people. He said, “Keep your profile simple and grammatically correct.” That was his mantra to reach out for the best opportunities. The discussion concluded with a question-and-answer session where the students and teachers put forth their queries, which Prabhu did his best to answer.